This is the first of a series of posts that will explore what prominent thinkers and philosophers can teach us about today’s public multiversity, the modern university with its many colleges, departments, and other administrative units that play multiple functions and roles in our society. What can Plato teach us about higher education today? At first glance, it would appear very little in an age of standardized assessment, digitized curricula, and competency-based education, not to mention the challenges of the public intrusion into the classroom and campus life while, at the same time, defunding state universities where they have become essentially private institutions that disproportionally rely upon student tuition for revenue. Add to the multiple functions and roles that the university plays in our society – academic specialization and scientific research, training in technical competencies and general education, the commercialization of knowledge and acting as a community’s economic engine – it is difficult to see what Plato would have to offer to today’s multiversity. True, Plato may be able to offer some insight to schools that are small in scale and are in principle liberal arts or religious in purpose, but it is less clear what he would have to contribute to the public university with its congeries of communities of students, faculty, staff, administrators, alumni, community activists, government officials, and business leaders. Why bother with Plato at all? In fact, if you look at Plato’s writings about education, such as The Republic, what you discover is fairly disturbing: state supervision of education that includes censorship and the sharing of women and children in order that philosophers can focus all their time on studying typologies of realities. Only perhaps the most ardent advocate of political correctness and the strongest proponent of the hooking up culture on campus would support Socrates’ proposals; but, for most of us, these suggestions strike us as strange, if not offensive. Employment is the motivation for most students to enroll into college, not to become grass-fed star-gazers of Platonic forms; academic freedom and not meddling state censorship is needed for scientific research to commence; and honor resides in our most prized possessions, usually our family, not in a 1970s-style swapping of them. Socrates’ ideas might work well for a religious cult in Idaho or in an Asian totalitarian state, but, for today’s multiversity, they would be a disaster if implemented. Nonetheless, I think that we are able to glean some insight from Plato’s writings that might be applicable to today’s multiversity. Regardless of whether we actually agree with the contents of Socrates’ ideas, what we find in Plato’s dialogues is Socrates constantly engaged in learning how to learn. It is worth noting that Socrates never claims how to teach; instead, he shows us how to learn. For Socrates, learning is less about mastery of a technical skill or acquiring a body of knowledge, but inquiry about something in the right manner and for the right reasons, and to persist in doing so, even if the initial answers fail to be satisfactory. The answer to the question “what is justice?” in The Republic is not as important as how and why we ask this question. As we see in the dialogue, how and why one tries to know such a thing reveals more about the various characters’ desires, motives, and abilities than the correct answer. Likewise, when we read Plato’s dialogues, we also learn about ourselves in struggling to understand not only the question being asked but how it should be asked and for what reason. This inward reflection can ultimately lead to periagoge: the turning of the person from focusing on the temporal and transient to the eternal and permanent. But we should be careful to note that periagoge is not a religious or mystical conversion but rather a heightened awareness and openness to all aspects of reality that emanates truth. Periagoge emerges from our love (eros) for truth, whether manifested in grandiose and abstract projects like searching for the Higgs Boson or in smaller and personal ones, such as providing comfort and companionship to a bereaved friend. For the multiversity, the love for truth can be manifested in an assortment of ways depending upon a person’s role in the school: the teacher loves the student; the researcher loves the subject matter; the administrator loves the school and thus facilitates the conditions where periagoge becomes possible. To answer the question “why are you here?” is to reveal what you love. This is not to belittle concerns about status, prestige, and power, but they should be secondary to the Socratic aim of searching for truth. Periagoge requires ourselves to step outside of narrow confines of self-interest and desires for the common good of the multiversity. If Socrates’ answer to the question “why learn?” is a love of truth, then the answer to the question “how?” is dialectics: reasoned argumentation that is open to the truth. In Plato’s dialogues we see characters engage in both dialectics and eristics, the latter which is sophistic rhetoric aimed to defeat an opponent. From these dialogues we are able to distinguish which mode of inquiry will lead us to truth and which one will not. But, in addition to a genuine love of the truth, what also is required for dialectics is a community of like-minded people; for, in Plato’s dialogues, Socrates always pursues truth with others. Dialectics therefore is a communal inquiry that aspires to be collaborative, with various participants contributing to a better understanding of the truth. It requires people to reflect on their own point of view and then proceed to understand the viewpoint of others, which hopefully leads to discussion and possibly to periagoge. For the multiversity, dialectics can only exist in smaller communities, such as the intimate seminar class as opposed to the large lecture hall or in the department meeting rather than in a college forum, as it is difficult to imagine Socrates hosting a TED Talk (despite recent attempts to portray him doing so). It would appear that the ideal form of higher education for Plato would transpire at the small liberal arts or religious college and not the multiversity. Although this would be the preferred model, the multiversity is a reality in which many of us live and is unlikely to disappear soon, so wishing it away is merely to deny reality rather than confront it. Therefore, for Platonic ideals to exist in the multiversity, the communities must be scaled down to a humane level where dialectics can take place in the pursuit of truth. The back-and-forth and give-and-take of conversation provides a space for periagoge to occur for students, faculty, and administrators (assuming that they are not all sophists). By scaling down various departments and administrative units to a humane level, the multiversity is able preserve a place for the human being to flourish rather than cater to the customer, producer, or manager. Plato therefore can provide a guiding philosophy and methodology to the multiversity in the pursuit of truth and the method of dialectics for all of its members. Rather than claiming how to teach, e.g., producing knowledge or making skilled workers, the multiversity could orient itself to how one learns as a student, a faculty member, and administrator: why am I here and what should I love? These questions, possibly the most important questions, entail communities of scale and like-minded people for which the multiversity can make space. Again, practical concerns of employment, accreditation, and budgeting also have to be addressed; but, under Plato’s ideas, these affairs are not pursued for their own sake but are secondary and subordinate to the study of truth. For, as Plato notes, the answer to these and other questions matter less than how and why we ask them. Lee Trepanier is a Professor of Political Science at Saginaw Valley State University. More information about him can be found at http://svsu.academia.edu/LeeTrepanier. It seems more likely that people will find what they need elsewhere than that the multiversity will turn its attention to the matters that Socrates was concerned with. I would first teach students that Socrates is a Jungian archetype created from Plato’s mind. Plato used Socrates as a teaching tool like East Asia used Bodhidharma. They created – out of written words and storytelling – a perfect, embodiment of whatever teachings the political and religious powers wanted to convey to their people. 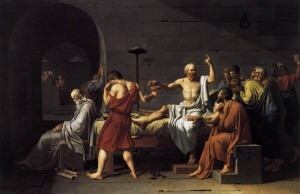 Socrates is an archetype of the perfect radical philosopher and martyr. I have limited knowledge of Plato’s writings and his characters but I think I do get the ‘gist’ of his teachings. In our pluralistic society not everyone is going to identify with the passion and verve of Socrates. I don’t think Americans want to be revolutionaries, they want good jobs and a good income. So if I was going to teach Socrates in college, I would teach him along with other Archetypes – Such as Bodhidharma, who was by myth – the sixth Buddhist patriarch who brought Buddhist thought and his religion to China. I would teach that Socrates embodied ideas that he believed in and I would push that someone like him had the clarity to actually expound his teaching’s to the mass populations of society. No small feat sense back then nobody had the internet, television, newspapers or cell phones. I am a layman philosopher and seeker who has a bachelors degree and I wish I studied aerospace engineering, with goals of becoming an astronaut. But I am not. However, I can completely live with that and live a really, really, really, good life. I wish the gift of math and science on my son as well his firm rooting in reading and the language arts. He is almost two years old and I hope and pray he can learn most of his philosophy and humanities as well as core history in High School, like the rest of the world. Then if and when he goes to college I hope he will study and major in some sort of math, science and engineering, and I hope he sees with absolute clarity the joy in that kind of life. Today I try to use the shrewd teachings of Abraham and Christ and the skillful means of the Buddha to keep my wife and family as well as my own ideological self – kept together, fun and moving. I want my son to seek but I do not want him lost. Thanks for your article professor!